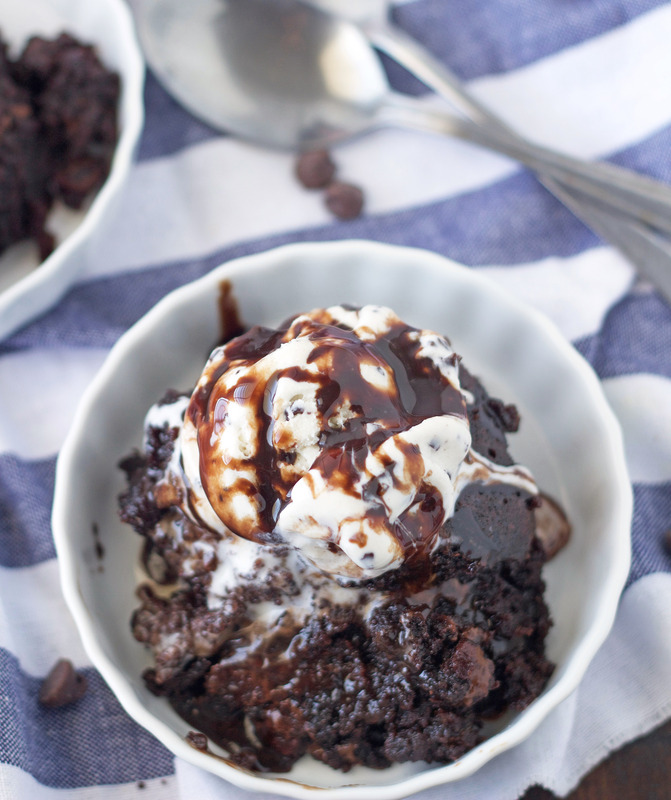 This Molten Brownie Pudding made in your Instant Pot is decadent, divine a chocolate lover’s dream come true! Scoop some ice cream on top and you’ve got a fabulous dessert. I know it’s November and your mind might only be thinking pies and pumpkin desserts right now, but today let’s take a break from all that holiday baking hoopla and talk chocolate, Molten Brownie Pudding to be exact. It’s no secret chocolate is my life (ok, so is peanut butter). I don’t know about any of you, but a chocolate dessert at our Thanksgiving isn’t unusual. So even in the midst of all my fall baking, there is always chocolate baking going on. 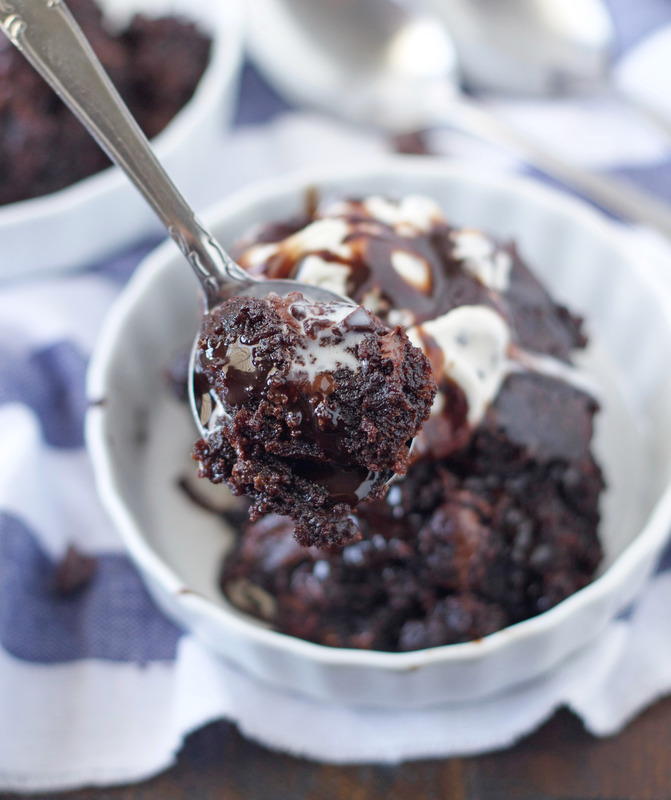 So if you’re like me and you always have a chocolate craving then this Molten Brownie Pudding will definitely curb that craving. Served with a scoop of vanilla ice cream. . . .um hello!!! I could lie and tell you it was awful, disgusting and totally not worth the calories, but that would not be very nice of me. Butter a 6- to 7-inch souffle or baking dish with 1 tablespoons of the butter. In a small bowl, whisk together the flour, cocoa and salt. Add this to the sugar and egg mixture and mix until just combined. Mix in the vanilla and the remaining 6 tablespoons of melted butter and mix until just combined. Select Manual and cook at high pressure for 30 minutes. Once cooking time is complete, do a quick release. Carefully remove the lid so that any condensation doesn't drip on the pudding. Carefully remove the baking dish using mitts or tongs. If your dish doesn't have handles, you can make a sling with a piece of foil, folded in half twice, that's long enough to go under the dish and stick up 6 inches on each side, creating handles. My dish doesn't have handles and I didn't want to worry about making a foil sling, so I just carefully lifted it out with hot pads. Does this use All Purpose flour, or Self Rising? Hi Lynette! It uses all-purpose flour. If a recipe calls for self-rising, I will always specify that in the recipe. I’ve made these several times. I use small ramekins instead of one casserole dish. They are a hit with the entire family! Hi Susan! I’m so glad you love these, and thanks for letting me know it works using small ramekins. I love hearing from my readers, so thank you for leaving a comment. Hello! Can this be made ahead of time and served at room temperature? Hi Sarah! Yes of course you can, but it really is best served warm. I refrigerate any leftovers and then reheat it in the microwave for a few seconds. How many does this serve? If I needed to could I stack two bowls? Does the cook time change? I need to serve 8 people! Hi Claire, this serves only about 4 to 5. I have never stacked two bowls in my instant pot and don’t know that I would. You could google it and see if it’s possible. Let me know if you give it a try.